When temperatures drop below 45 degrees, tire performance can suffer as rubber compounds stiffen and get brittle. 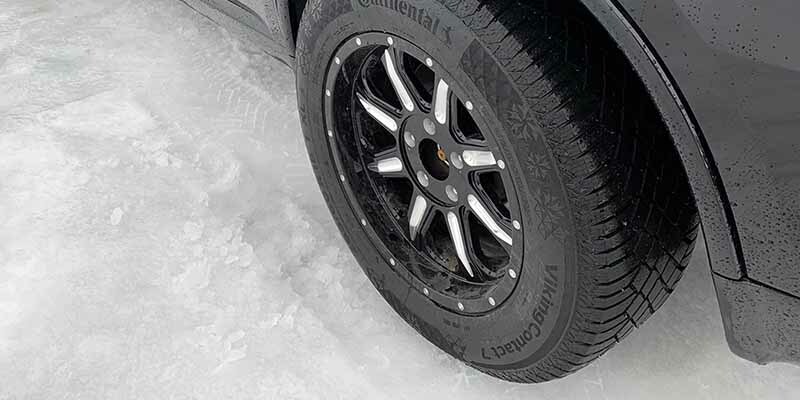 Using a patented compound process, Continental Tire engineers have added a special ingredient – canola oil – to help the tread stay softer and flexible in extreme cold. It’s just one of the many innovations designed into the Continental VikingContact 7 to make it stand out in its somewhat frozen field. The new VikingContact 7, already released in 2018 in the Northern European markets to high accolades in third-party independent comparison testing, will be available to North American tire dealers in the third quarter of 2019. The new design replaces the current 44 sizes of the Continental WinterContact SI and will be available in 91 sizes within the U.S. and Canada (15- to 19-in. rim diameters, 40 to 70 aspect ratios, and speed ratings T and H). The tire was introduced to a small group of media and industry influencers across the United States and Canada at a special event at the ICAR racing facility outside Montreal, Quebec in February. Engineers and product managers on hand provided details on the design concepts and their ability to impact winter driving performance – including the wide range of weather conditions from freeze to thaw. 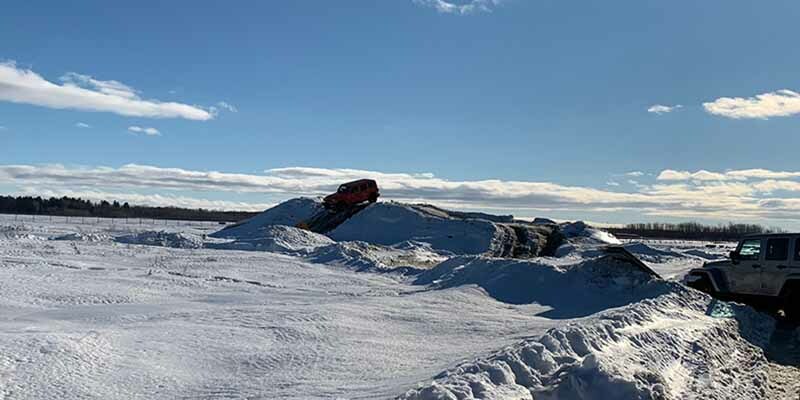 At the product launch event, the new VikingContact 7 tires were put to the test on multiple courses, including a challenging off-road course. In addition to canola oil, a rapeseed derivative, the new VikingContact 7 includes a number of innovations. One feature is a Nordic tread compound made up of active grip silica for impressive grip in wet conditions. “Active grip silica” means the tread is developed using a highly filled compound with a high amount of silica. Increased silica is well connected to the softer rubber polymer used, which leads to better wet and ice performance. The new VikingContact 7 offers confident driving stability, control and performance in winter conditions. The new pattern design features an efficient groove network that reduces hydroplaning on wet, slushy roads. The interlocking block bridges provide perfect tracking and stability on snow. An advanced grip concept includes a high number of 3-D sipes, keeping the snow edges effective and providing powerful traction and braking on snow- or ice-covered roads. Traction features help with improved acceleration and control in slippery conditions. The tire also meets the severe snow service requirements of the U.S. Tire Manufacturers Association (USTMA) and the Tire and Rubber Association of Canada (TRAC). 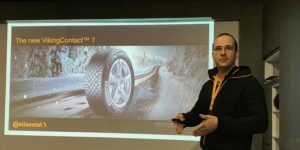 In speaking with Dr. Timur Yilkiran, project leader for winter tires and responsible for the development of the company’s winter tire line worldwide, he shared that the goal in the new VikingContact 7’s development was to design a winter product that balances snow, ice, slush and wet performance. He said the new design offers significantly improved ice braking, noise and dry braking characteristics with similar snow traction and snow handling when compared to the WinterContact SI it is replacing. The compromise to achieve a 7% improvement in ice braking performance (in addition to improved noise and dry braking performance) with a mere 2% reduction in wet braking when compared to the WinterContact SI. And because the WinterContact SI was already a high performer in wet braking by comparison to others in the market, it was seen as a minor tradeoff to achieve such improvements in other areas, said Yilkiran. He went on to say that the development goal was to create a tire that can handle all winter conditions, without overemphasizing wet or snow. The result is a well-balanced tire that covers seasonal conditions beyond snowfall alone that performs well in all winter conditions – fresh snow, ice, rain, slush, packed snow and even dry. 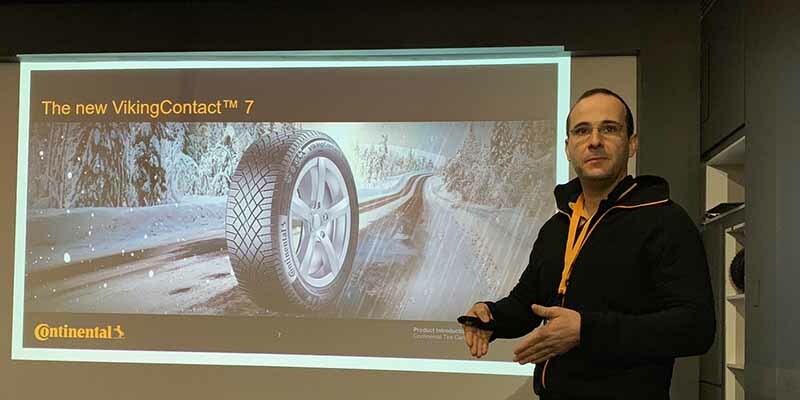 Dr. Timur Yilkiran, project leader for winter tires and responsible for development of the company’s winter tire line worldwide, said the goal in the new VikingContact 7’s development was to design a winter product that balances snow, ice, slush and wet performance. The new winter tire product, which taps the global expertise of the Continental Tire engineering team, is available for North American tire dealers to order now with orders being shipped August and September for the U.S. and July and August for Canada. Design: Directional, with steep main grooves for good wet performance; large block elements for good snow performance; interlocking block bridges help stabilize the pattern.